It’s rhubarb season! It seems to be one of those flavours that you either love or hate. I am definitely a lover! Hence, when I saw this recipe over at Style and Shenanigans I was keen to give it a try. Vanessa, a friend and new Thermomix customer, is the author of the beautiful blog Style and Shenanigans. With a focus on an everyday, achievable style that oozes sophistication she covers everything from fashion, entertaining, travel and decorating. Vanessa was all-up for me to convert her recipe into Thermomix format.A few things to note about this Thermomix cake recipe. Firstly, there is very little butter, only 60g, but it makes up for the fat content in sour cream. I love the texture that sour cream (or yoghurt) gives to a cake. 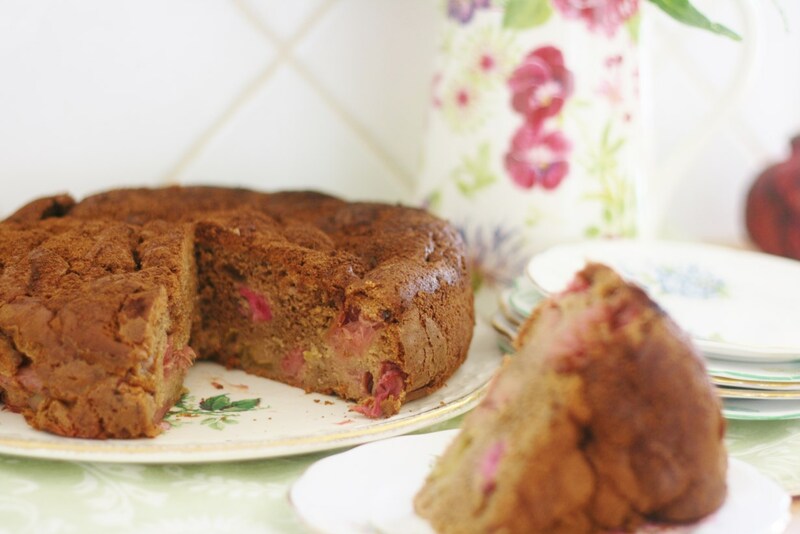 You will notice when you make the cake that there isn’t much liquid, that is because the rhubarb itself, when cooked, gives a lot of moisture. The recipe is high in the sugar stakes. The original recipe was even higher, 380g for the cake alone, but I just couldn’t do it! I have reduced the quantity to 300g plus the 80g for the topping. The reason for so much sugar is obviously, that rhubarb is really a very tart fruit. And sugar, well, it makes it sing. If you are wanting an even quicker method, you can chop the rhubarb stalks into thirds and then chop it finer in the Thermomix. Just ensure you do this step first 5sec/sp5 and set aside. The quantity of rhubarb in the recipe is too much to add to the TM bowl and so I added half of the mixture to the bowl and then mixed the other half into the batter when in the cake tin. If this is a little too rustic for you, then you could mix it all together in a larger bowl. Lastly, as always with cakes in the Thermomix, don’t over beat. Use the spatula to help the flour and sour cream to mix in. Preheat oven to 180'C and grease a round 22cm cake tin, preferably spring form. Add lemon peel to the TM bowl with 30g of flour and mill 20secs/Sp10. Add 300g of sugar and butter (in large cubes) into bowl and cream 20secs/Sp5. Scrape down the bowl and add eggs, one at a time, allowing about 20secs between for them to combine 1min/Sp5. Scrape down bowl and whip another 30secs/Sp5. Add remaining 270g flour, bicarb, salt, and cinnamon to bowl and combine 10secs/Sp3, add sour cream and half of the rhubarb and combine a further 10secs/Sp3 with the aid of the spatula. Ensuring not to over beat. Smooth over with your spoon. Remember to use the Turbo function to get the last bits of batter from your bowl. Mix topping ingredients together and sprinkle over cake. Place in oven for 1 and ¼ hours or until cooked through. Allow to cool for 20 mins in tin and remove to a cake rack to cool. 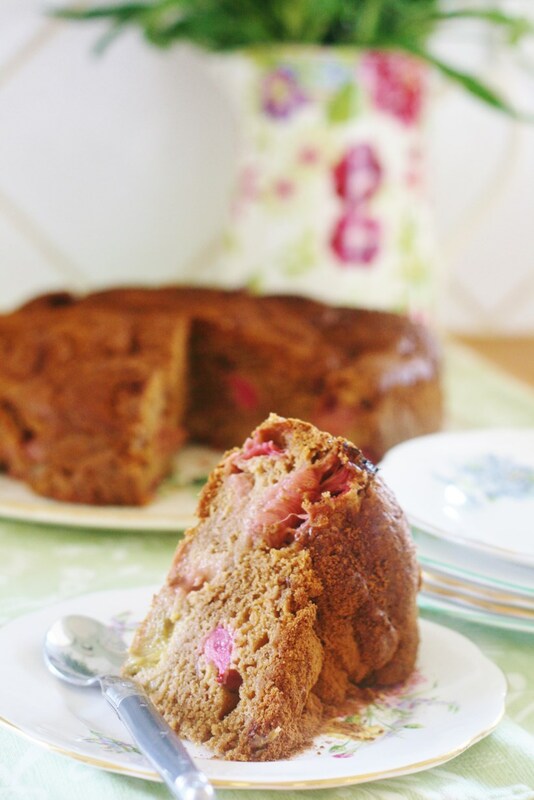 Love that recipe and also love Rhubarb…but here in Spain, you don't know how difficult is to find it! Love your blog and recipes…and following you in IG…thanks! FYI I'm a passionate Thermomix consultant too living in Barcelona….so, feel free to let me know if you need anything from here!